Renea Cruises Halong was launched in Sept 2018 by a super friendly and outstanding team who are working in tourism industry for a long time. With about 10 years of experience in the tourism industry and learn both from our competitiors and our guest’s comments, Renea Cruises is a boutique wooden vessel, classical and traditional design style, delicious and authentic cuisine, helpful crew team and offers an off-the-beaten-track itineraries in Bai Tu Long Bay. 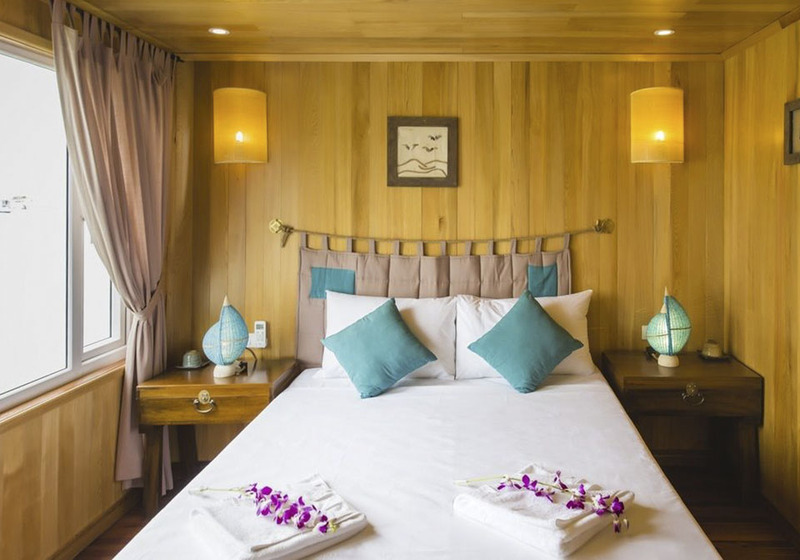 Your time with Renea Cruises will be remarkable and one of the best experience during your time in Vietnam. 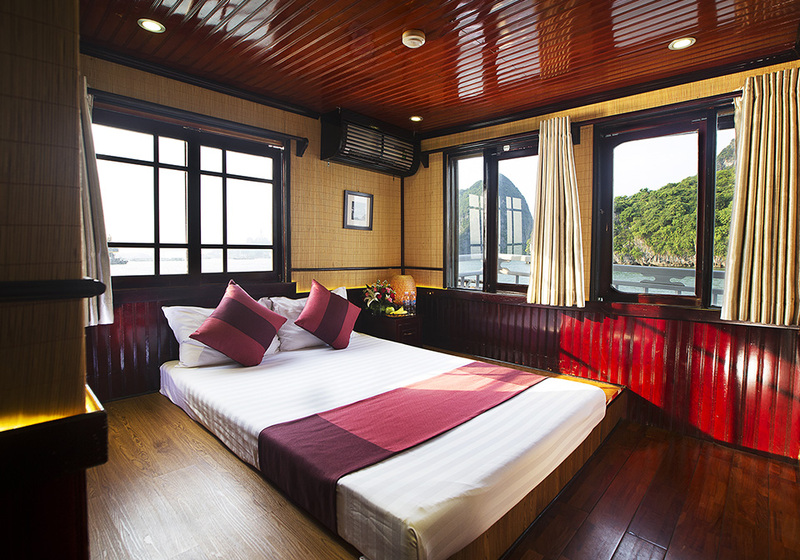 07:45 – 08:30: Our shuttle bus will pick you up from your hotel in Hanoi and start our trip to explore the most amazing bay in the North of Vietnam. On the way, we will have a quick stop at the middle of the way to rest. This also let you have a glance at Hai Duong Province and taste their traditional “Green bean cake”. 12:30: Arrive in our office at Hon Gai Pier, you will have a bit time to relax and enjoy a cup of tea/coffee. Wait for our captain to finish the registration and transfer by tender to our boat. 12:45: Enjoy welcome drink and spend a couple minutes to briefing about safety on boat and activities included then we check in our cabin. 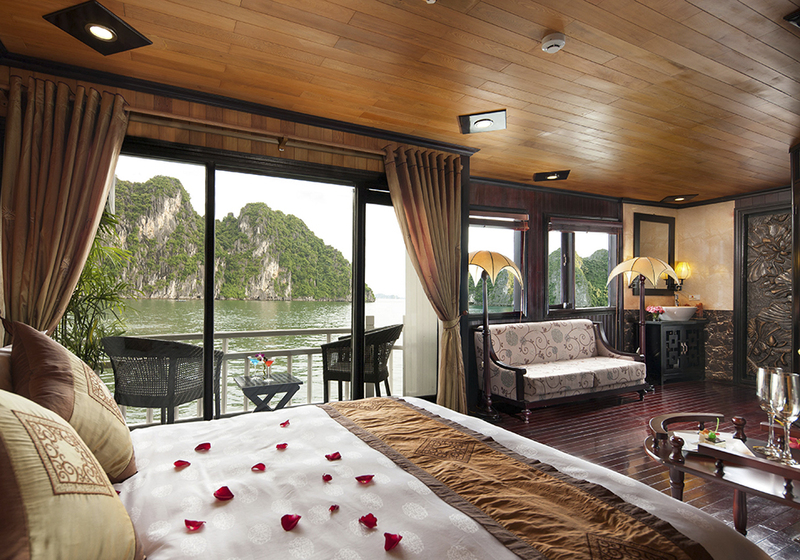 13:30: Delicious Vietnamese set menu will be served while leisurely cruising further into Bai Tu Long Bay. 15:00: Arrive in kayaking area – that is Cap La Island. Enjoy kayaking through the karst and breathtaking nature, swimming and relaxing. 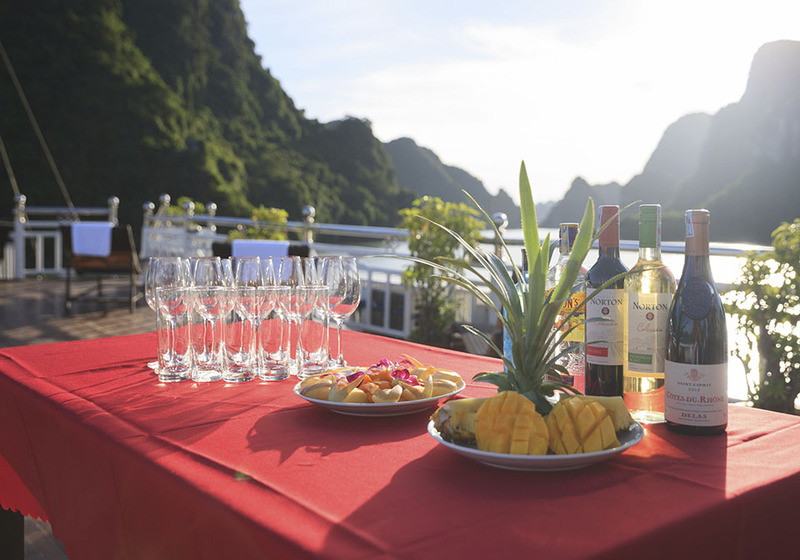 17:30: Get back to the boat and enjoys our Sunset party while our cruise sailing to the overnight anchorage. 20:30: Free time to challenge yourself in Vietnamese puzzle games, or gathers your group/family for a board game; try your luck with squid fishing or simply has a cocktail and enjoy the quiet night on the bay. 06:00: Start your day with a Tai Chi routine on sundeck or catch a morning view of the stunning bay’s landscape with a cup of tea or coffee. 07:00: Breakfast will be served in Western style, familiar to you to fulfill your strength and ready for another exploring day. 08:00: Explore the well hidden Thien Canh Son Cave and enjoy a white sandy beach at Hon Co Island. 09:00: Upon return to the boat you will have about 30 minutes to freshen up and finish packing. 10:00: Attend in a Vietnamese cooking demonstration. You can quickly learn a simple but delicious Vietnamese dish that Gordon Ramsey (a 2 Michelin Star Chef) used to guide – Nem Cuon. 11:00: Enjoy a traditional Vietnamese lunch on boat. 12:00: Back to the harbor and disembark in Hon Gai pier. 12:30: Farewell Halong Bay then our bus will take you back to Hanoi. Our tour guide will provide some interesting stories of Ha Long Bay and this cave, made by Mother Nature. 09:30: Transfer to a day cruise, we cruise passing several floating hamlets including Cap La and Cong Dam, we enter the Centre of pristine Bai Tu Long Geology Park. In there, we will visit Vung Vieng fishing village to interact with local people. 14:00: Spend more time for kayaking and swimming at Cong Dam, or relaxing on boat. If the weather allows, we can take a glance at Thay Cave before back to the anchor point. 19:00: Dinner will be served. 20:30: Free time for joining Games, you may also try your luck with squid fishing. 06:30: Start early Tai Chi demonstration on sundeck. 07:30: Breakfast will be served in Western style and furthermore with Vietnamese traditional food. 09:00: Finish packing and check out of your cabin. Prepare to join in our traditional cooking demonstration. 10:30: Vietnamese cooking demonstration on boat. 11:00: Enjoy a traditional Vietnamese lunch. From $121/person for 2 days 1 night cruise package. Including shuttle bus roundtrip with D-car Limousine.